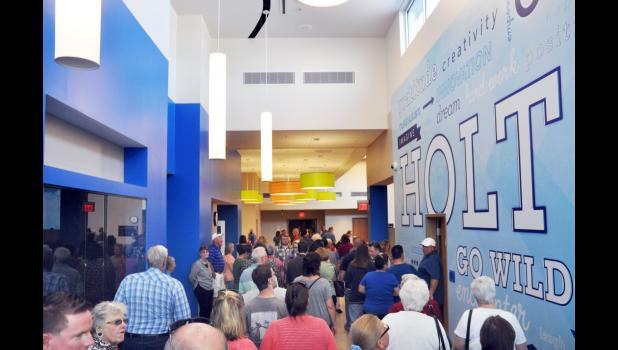 An open house and ribbon cutting ceremony was held Sunday afternoon to dedicate the new Holton Elementary School. “I want to thank the community on behalf of the board and the students for your forward thinking and providing such a facility to educate our children and, hopefully, draw other families to Holton,” said Holton Superintendent Dennis Stones. Several hundred northeast Kansans attended the 30-minute ceremony that was kicked off with the national anthem played by the Holton High School band under the direction of Jayme Malsom. Current and past school board members were present, as well as Nancy Meyer, the district’s former superintendent. Board President Allen Arnold recognized the number of people it took to plan and build the new 90,000-square foot school that serves students in pre-kindergarten through fifth grade. 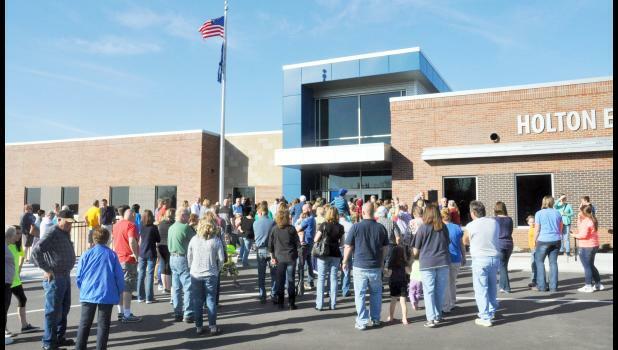 Holton Mayor Bob Dieckmann said the new school building, which features bright and spacious classrooms, lockers for students and bathrooms for each grade level, is a testament to the hard work of many people. Head architect Greg Porter of Hollis and Miller said that the district only had about two and a half acres of land to build the new school on. Michael Feamster representing Nabholtz Construction Company said the school building has already received an award of excellence by the Association of Buildings and Contractors. In addition, Nabholtz, which operates in 10 states, chooses one project a year that is the “most excellent in quality and leadership,” and the elementary school was chosen as this year’s winner. Beth Smith, building principal, said that some of her favorite features of the new school include the centrally-located library, the wide hallways for additional learning spaces, the full-sized gym and the murals that represent the school and district ideals. While the HHS band played the school song, board members, administrators, several teachers, Porter and Feamster cut a ceremonial ribbon to dedicate the new building. Members of the public were then able to tour the entire building with several fifth-grade students serving as guides at different locations throughout the building.